The powerful triple-odor protection defends your home against strong urine and feces smells. 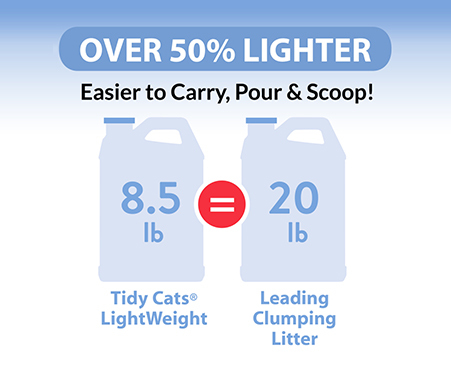 The lightweight formula weighs half as much as leading clumping litter for cats. With an added Ammonia Blocker that keeps ammonia odor from forming for at least two weeks when used as directed,* this litter provides protection from lingering smells. 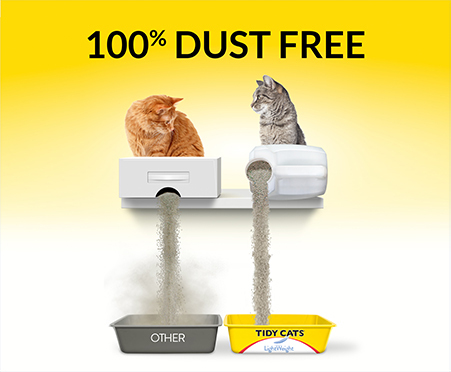 The 100% dust-free formula means the litter pours cleanly into the box. This Tidy Cats clumping litter is formulated for multiple cats. 1. Pour to depth of 3-4 inches. 3. Add more litter to maintain a depth of 3-4 inches. Pour close to the litter box for maximum Tidy-ness! Clean the cat box with warm water and a mild detergent between litter changes. I have been a Tidy Cats litter user for quite a while, and this is a great improvement over the original line of Tidy Cats. It is much easier to carry and pour and it smells great. Tidy Cats Lightweight I see fantastic! It not only kept my entire home from smelling like kitty liter but it stayed smelling nice no matter if my cat went to the bathroom hours ago or five minutes ago. Thank you pinchme for the free coupon for free Tidy Cats Tidy Cats Lightweight Litter. This product is awesome. I love how lightweight this is. It is easy to get into my cart, trunk and my house. The jug is the perfect size to maneuver and pour i to my litter box. My cats loved it. The was zero smell coming from the box. It clumped up and was easy to clean. Awesome product! I love Tidy Cats Lightweight cat litter. It is easy to transport! Also, it blocks the odor really well. I have been using the littler for a couple of years now and still love it! I received the Tidy Cats Lightweight coupon from Pinch Me nd ran to Shoprite to redeem it. I was happily surprised to find it REALLY lightweight and it really did destroy odors! Will definitely purchase again! I love and use Tidy Cats litter and was very intereted in trying Tidy Cats Lightweight litter, but thought being light weight it would not do a good job. Not only does it do a great job at it eliminating the odors, but I love that I can carry it with ease. it also clumped well and tight for easy scooping up and out. I got a coupon for this product. I absolutely love this cat liter.. Smells clean and no nasty smelling cat liter smell in my house. Will definitely be buying it for now on. I have used Tidy Cats for year but never bought the lightweight. I finally got to try it thanks to my coupon from Pinch Me for a free jug and I was very pleased with it. Not only is it lightweight but it works great at blocking the tough odors from the litter box that my 2 cats can create. My cats accepted it with no problem so I will be buying it again. I am really enjoying not selling the litter box like I once did. Tidy Cats Lightweight is very good in blocking odor and easier for me to handle! I recommend this litter for all to try! I was super excited to get a coupon from PINCHme for a free Tidy Cats Lightweight kitty litter. I have always wanted to try it but it is a bit pricey. I would say that it is a good deal if you have trouble transporting litter home. It really did not weigh much and did a great job at blocking odor from the litter box. This is a product that I would really recommend. The Tidy Cats brand is amazing. The coupon for Tidy Cats Lightweight that I received was in need. I loved this product for my cat because it eliminated the odor tremendously and the ammonia blocker feature just made me love it even more. I already picked up another jug! 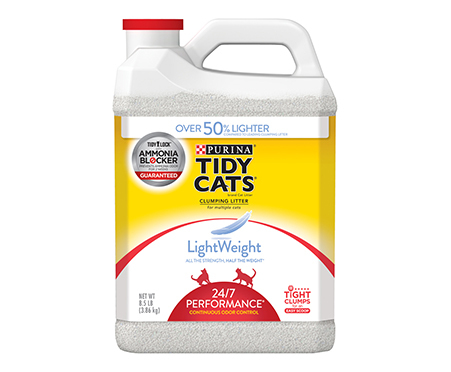 I love Tidy Cats products and after trying Tidy Cats Lightweight, I am convinced this is the best litter that I have tried. It clumps for easy cleaning. It blocks the ammonia smell. Highly recommend. This Litter works great and true to the name, it is light enough to carry. It is expensive though. I have been given the opportunity to try Tidy Cats Lightweight Formula through PINCHme, a company that sends out free samples to consumers to try. After allowing my cat to use the litter box containing this product, I have to say it does its job as advertised. It blocks any possible odors, eliminating any bad scents from the air. The packaging and lightweight formula makes it easy to lift, pour, and use. I would recommend it. Tidy Cats is the best litter I have found! Tidy Cats Lightweight litter is just as amazing as the regular litter but more convenient and beneficial. The ease of carrying this is well... Lightweight, no more struggling with trying to carrying this out of the store into the house and pouring that first pour. As much as I love my little man he tends to be very stinky and this litter has made that smell almost non-existent. Thank you Tidy Cats! I love the smell of the the litter, how light weight it is. I don't need to use the whole jug at once. Our litter box sits by my husbands office and he notice a significant difference through out the day with the Tidy Cats Lightweight! Tidy Cats Lightweight is easy to use, works well, only complaint would be it seems to track more, even with the use of mats under/around the little box. I really like the new Tidy Cats Lightweight with the ammonia blocker. 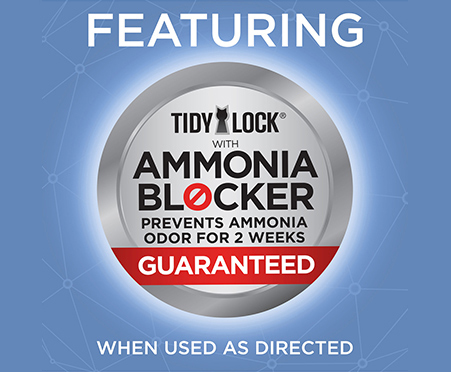 I think the ammonia blocker actually makes a difference because the original tidy cats litter would always start to smell after a couple of daus but this one definitely holds up way better. Overall I am happy with the "Tidy Cats" product. I like the packaging and that the product is specifically " Tidy Cats Lightweight" as I usually have a horrible time trying to lift heavy bags and pour the litter into the box. Thank you for providing me with the opportunity to try this item! I was given a coupon to redeem for Tidy Cats Lightweight, I was happy with this product. It blocked a lot of the smell that I typically have with the litter boxes. I was very happy with the lightweight product and I would purchase it again. I love the Tidy Cats LightWeight. It really helped with the odors. I would definitely recommend. I recently went on vacation and came home to an overpowering urine smell despite the fact that my husband had been cleaning the box regularly. I was extremely excited to give this litter a try and I can't believe how well it worked. I don't smell what I smelled when I walked in and I feel like I can have friends over again!